In Volume 2: Let My People Go! [Exodus], you will finish the book of Genesis with the stories of Abraham, Isaac, and Joseph, and then learn all about Moses and the Israelites’ great escape from Egypt. Find out who wrote the Bible, and teach big concepts like sin, salvation and redemption! Volume 2 contains 4 weeks of lessons. 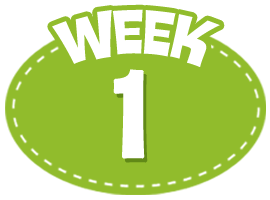 Week 1: The children will hear stories from Genesis – the first book of the Bible – and learn the definitions of salvation and redemption. 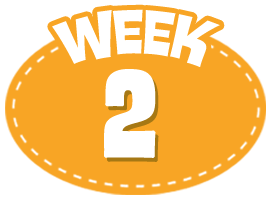 Week 2: The children will learn about the Old Testament Canon, and hear stories about Abraham’s descendents. 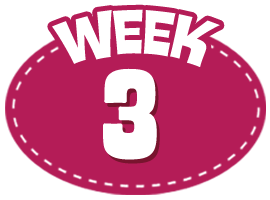 Week 3: The children will learn Moses’ stories from the book of Exodus. Week 4: The children will hear stories about the Israelites from the book of Exodus, and will discover the Old Promise and the New Promise. Video 1 Welcome Custom Welcome Video: Buck Denver delivers news about a specific time of day. Small Group 1 Relationship Building Each child has the chance to share a news headline from his/her own week. Video 2 Learn: Redemption & Salvation Creative video that teaches the big concepts of salvation and redemption. Small Group 2 Rescue, Rescue, Rescure A checkers-like game reviews the concepts of salvation and redemption. Video 3 Learn: Patriarchal History Fun video that introduces the patriarchs and shares the story of Abraham. Small Group 3 Cap'n Puzzl'n This is a fun, fast-paced, relay trivia game designed to get everyone up and moving! Video 4 Bible What's It? This is a trivia game that reviews the day's lessons. Video 1 Welcome Custom Welcome Video: Buck Denver delivers some future big news in this fun video. Small Group 1 Relationship Building Each child has the chance to imagine his/her own news headline. Video 2 Review: Genesis Video that reviews the whole book of Genesis. Small Group 2 Ready, Set, Genesis! Crazy game that combines Bible look-up and a race to review the book of Genesis. Video 3 Learn: Who Picked the Books to be in the Bible Video that explains who picked the books to be in the Bible. Small Group 3 Canon Chaos Memory-type trivia game that reviews the Old and New Testament canons. Video 4 Bible What's It? Trivia Time: fun game that reviews the day's lessons. Video 1 Welcome Custom Welcome Video: Buck Denver delivers some fun news in this welcome video. Small Group 1 Relationship Building Each child has the chance to share a crazy news headline with his/her small group. Video 2 Learn: Sin Powerful custom video explains sin, and its power, presence and the stain it leaves - and why God wants to rescue us from it! Small Group 2 Throw Me a Life Saver Let's get talking! This game encourages kids to discuss how sin affects their lives. Video 3 Learn: Exodus, Moses This video shares the story of Moses leading the Israelites out of Egypt, including God talking to Moses through a burning bush and the plagues He put on the Egyptians. Small Group 3 Exit in Exodus Active game has kids up and moving while they answer trivia questions about Exodus. Video 4 Bible What's It? Trivia Time: This is a trivia game that reviews the day's lessons. Video 1 Welcome Custom Welcome Video: Buck Denver shares some happy news in this welcome video. Small Group 1 Relationship Building Active Game that encourages kids to guess what time news events happened, and get to know the other children in their small group. Video 2 Review: Exodus Review Time: video that reviews the stories learned from the book of Exodus. Small Group 2 Get to the Kingdom Active game that encourages kids to look up answers in their Bibles, and also to get up a move! Video 3 Learn: Exodus - Important Instructions This video teaches about the 10 Commandments that God gave to Moses. Small Group 3 Cap'n Puzzl'n Crazy fun game combining- building a puzzle with a hot-potato style twist! Video 4 Bible What's It? Trivia Time: game that reviews the day's lessons.